All photos courtesy of Inn at Langley. You’ll get Pacific Northwest Patagonia pampering when you stay — and, most importantly, eat — at The Inn at Langley near Seattle. This is one for people who appreciate nice things, but also own a well-worn pair of (premium) hiking boots. LANGLEY, Washington – The village of Langley, on Whidbey Island not far from Seattle, is much like a village in the start of an early Steven Spielberg movie, except that the bad part — the shark, the UFO — never arrives. Nestled on the eastern edge of the island, hard up against the Saratoga Passage of Puget Sound, it boasts a small downtown of neat, well-preserved buildings, with a main street dotted with wine shops, an old, single-screen movie theater, the Clyde, and an actual, functioning, non-tourist-trap general store. Tidy clapboard houses wind up the blocks, and there are staircases down the cliff to a public walkway along the water. , just steps down First Street from downtown, is the nicest place in town. It’s less secluded than you might expect, with homes on one side, shops on the other, and an almost motel-style parking lot between the main building and the street. (There’s a Tesla charging station in the lot, natch.) But that’s because downtown Langley is tightly packed. The Inn is perched on the edge of the island, and the guest rooms face the water, so that each offers an expansive, and much more private, view of sea, sky, and the Cascade Mountains in the distance. With its post-and-beam architecture, Asian-inspired and Frank Lloyd Wright-influenced, your room feels most like a Pacific Northwest mountain cabin — one that just happens to have amazing waterfront views. But despite that natural beauty, despite Langley’s small-town charm, despite the sights to see along the entirety of the 58-mile-long island, none of that is why you’re here. If you’re at the Inn at Langley, you’re here to eat. Chef Matt Costello is a co-owner of the Inn, and on weekend nights he prepares an exquisite multicourse tasting menu, locally inspired if not entirely locally sourced. The intimate dining room, which seats around 20 or so, is built around the open kitchen in which chef Costello and his team work. Part of the fun is the food, which is carefully prepared and exquisitely plated, but a big part is also the interaction with the staff. Chef Costello welcomes you, works while you eat, and is a genial presence throughout the meal. The sous chefs move from kitchen to table, serving your courses. If you’ve got any questions about a dish, or just want to talk about it, they really know. The food, and the entire experience, is fantastic. 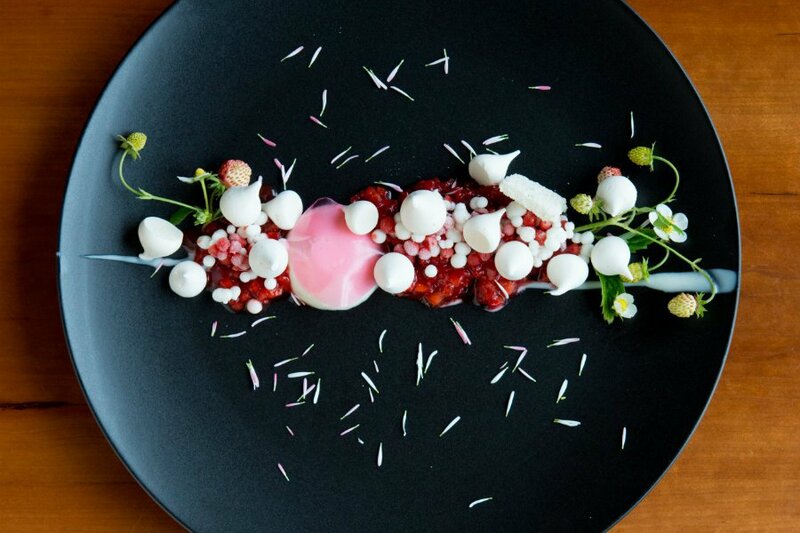 Rhubarad juice, nepita mint flowers, primrose, green almonds and fresh cheese. Cold poached salmon, asparagus, horse radish and bergamot powder. Rooms cost from $255 to $695 per night, depending on time of year, day of the week, and whether you opt for one of excellent standard rooms or instead one of the grander suites or cottages. (The cottages are huge duplexes, but they manage to seem less luxurious, closer to a perfectly nice rental condo than a cozy, pampering hotel room.) Dinner is $165 per person, tax and service, with an optional wine pairing at a price that varies depending on the wines but hovers around $95 for the full pairing and $65 for a “featherweight” pairing. (As always in life, and especially when you don’t have to drive, opt for the wine pairing.) A fantastic, fresh-made buffet breakfast is included. . Or if you want someone to do it for you, . Whidbey is the largest and southernmost island in the Salish Sea archipelago that runs between Washington State and Vancouver Island and cuts down to Seattle and Tacoma. The fourth longest and fourth largest island in America, apparently, with a population of 60,000, it’s home to several small communities and, on its more commercial northern end, Whidbey Island Naval Air Base. The southern half is more rural, with small agriculture, artists, and a tourist economy. Langley is the most preserved and most charming village on southern Whidbey. Pacific Northwest Patagonia pampering. The rooms and bath supplies are luxurious but not decadent; everything is in fantastic shape but not necessarily renovated with up-to-the-minute technology. There’s a spa with treatment rooms, but no sauna and steam. Dinner is innovative and impressive and delicious and local, but has no Thomas Keller haute-of-the-haute affections. You are your own bellman. The Inn is for people who appreciate nice things, and have the money to buy it, but also own a well-worn pair of (premium) hiking boots. Couples, families, groups of friends — so long as everyone’s a foodie. It’s also a great spot for entry-level luxury travelers: not too far away, not off-puttingly pretentious, not cheap, but not prohibitively expensive. That is to say: accessible, in all ways. The only dinner served is chef Costello’s tasting menu, and it’s only served on Friday through Sunday nights, with Thursday service added in July and August. Breakfast is served for guests every day. There’s no other food and no room service. There’s the on-site spa and a walkway with benches along the waterfront. The hotel has a small handful of bikes to borrow. But downtown Langeley, with its restaurants and tasting rooms and movie theater, is a quick walk away, and the friendly staff can direct you to off-site options, which also include kayak rentals and whale watching. There are 24 rooms in the main building, each with a wood-burning fireplace, an oversized jetted tub, a sizable terrace, and sweeping water views, including from the tub. Two suites offer all of that, more space and a full kitchen. And two duplex cottages built into the cliff offer spacious living areas upstairs and bedrooms downstairs, with fireplaces on both levels, huge windows, but less outdoor space. Everything you’d expect from a luxury property, but not more than that. Robes and bath supplies. WiFi. Speakers. Wine and beer in the fridge (for a price); snacks in a basket (for free). Complimentary firewood and fire starters. DVDs on request. Complimentary passes are available for the movie theater and a yoga and Pilates studio in town. Essentially none. More on-site food might be nice, but downtown Langley is just steps away. The setting is majestic, the hotel is gorgeous, and dinner is delicious and memorable. Come for the dinner; stay for the views. The dining room is a view in itself. The Inn at Langley is steps from Langley’s main drag and a short bike ride from the rest of the restaurants and shops in town. Many other sites on the southern part of the island are within a half-hour drive. There are art galleries and wine-tasting shops in Langley, several good restaurants. Further afield on the island is more of the same, various state parks and old fishing villages. Some parks offer great hiking; Fort Casey State Park features a defunct pre-World War I-era defensive fortress, designed to protect Washington’s ports (and almost immediately rendered defunct by the advent of military aviation). You can climb over it and explore. There’s not a lot to do at the Inn itself beyond the great dinner and the great views. It’s a great place to sit, gaze at the water, and read a book. But most any other activity will require leaving the property. The easiest way to get to Langley is to drive to the mainland waterfront village of Mukilteo, about 40 minutes north of Seattle (or an hour north of SEA-TAC airport), and hop a quick ferry across to Clinton, a more commercial community than Langley that’s further south on Whidbey Island. There are no reservations for ferries, and there can be waits, so allow extra time. From Clinton, it’s a 15-minute drive to Langley. At Whidbey’s northern point, in gorgeous Deception Pass State Park, there’s a bridge to the mainland. It’s a pretty drive, both on the mainland and through the island, but it takes an hour to get from the bridge to Langley. Driving from Vancouver, B.C. down Interstate 5, across the bridge, and then down Whidbey, takes a bit more than three hours. It’s a fun drive, if you’re coming from the north and in the mood for a road trip. Driving up and around from Seattle, no matter how pretty, would make no sense: It’s a two-hour detour. You can walk into Langley, and the Inn offers a few bikes. But for exploring the island, and for getting to the Inn, a car is a must. В интеренете нашел важный интернет-сайт на тематику дизайн интерьеров в киеве.